• Derived from our spray, this innovative product creates a whipped texture for ease of application. • This non-aerosol, hydrating Instant Sunless Tanning Mousse creates a "gorgeous tan" without the sun! 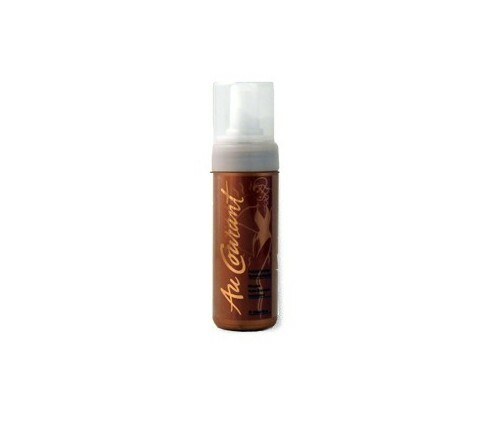 • Au Courant Self Tanning Mousse will revitalize and create a natural looking tan. • Au Courant Sunless Tanning Clear Mousse contains Chamomile, Orange Peel and AHA’s. • Au Courant Sunless Tanning Clear Mousse is Non Sticky and Non Streaking. • Skins elasticity will be supple and baby soft. Au Courant Platinum Sunless Tanning Mousse is also available with the bronzer (color guide).